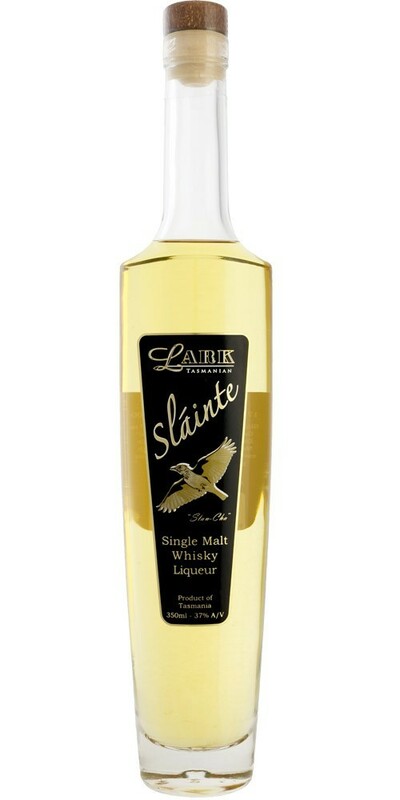 Slainte was developed by Lyn Lark after a strong demand for a unique Australian whisky liqueur. Slainte is a marriage of mature single malt whisky with a distilled spirit of herbs and spices produced in a smaller copper pot still. The two are carefully combined to give the right complexity of character, spiciness and sweetness, whilst maintaining the delightful overtones of the whisky. Notes provided by Lark Distillery. Today Lark's is one of Australia's leading distilleries, producing high quality, premium spirits using traditional time honoured methods. The vision of producing Tasmanian malt whisky was born on a trout fishing trip in the highlands of Tasmania. Bill Lark’s father in-law Max produced a wonderful bottle of single malt, and as they enjoyed a drink in the park at Bothwell, surrounded by Georgian buildings, barley fields and the gentle flowing of the Clyde River, Bill remarked to Max, "I wonder why there isn't anyone making malt whisky in Tasmania". Lark Distillery is a family affair; Lyn and Kristy Lark (Bill's wife and daughter, respectively) have played an integral part in growing the business. When Kristy joined the team as head distiller, she was one of the world's youngest female distillers.